According to Chinese Astrology, the Year of the Snake person is a smart person. Chinese soups are completely different from Western ones. The Chinese Spring Festival is considered the most important among other festivals in the Chinese calendar. 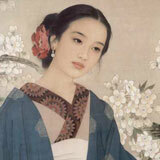 Check out these one of a kind, hand painted Chinese paintings.